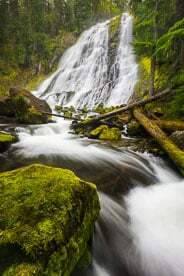 Secluded Beauty - Warm Springs Falls drops over a sheer basalt wall into a lush, mossy valley in a forest sprinkled with autumn color in the Umpqua National Forest in southern Oregon. 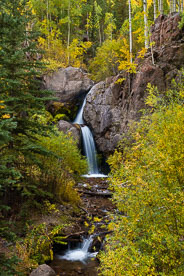 Woodland Grace - Nellie Creek Falls gracefully steps its way through a forest filled with the golds and greens of early autumn in the Gunnison National Forest outside of Lake City, Colorado. 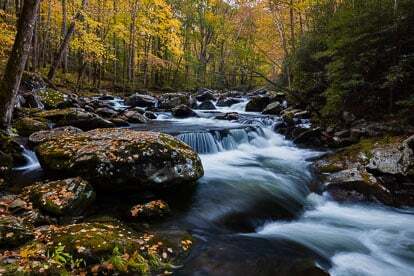 Golden Bend - The Middle Prong of the Little River flows through a golden forest and tumbles around a bend in the Tennessee side of Great Smoky Mountain National Park. Golden Grace - Kitchen Creek gracefully drops over B.B. 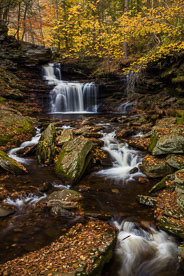 Rickett Falls and winds around leaf covered rocks in autumn at Ricketts Glen State Park in northeastern Pennsylvania. 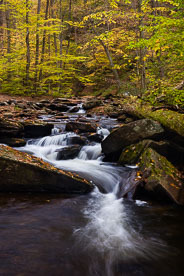 Autumn Dance - Kitchen Creek twists and turns around boulders as it flows through a golden forest in Ricketts Glen State Park in northeastern Pennsylvania. 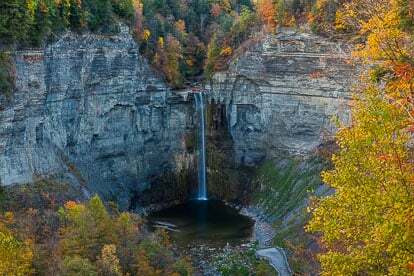 Autumnal Grace - Multicolored trees and brush frame Taughannock Falls as it plunges 215 feet over a rocky cliff into a placid pool at Taughannock Falls State Park in central New York. 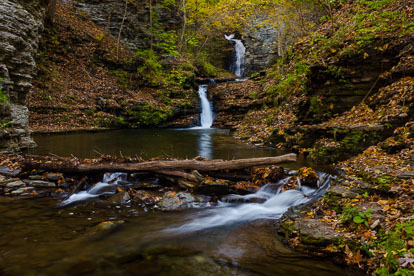 Gentle Steps - Catlin Mills Creek gently flows over Deckertown Falls and winds its way down to a calm pool ringed with fallen autumn leaves in the village of Montour Falls, New York. 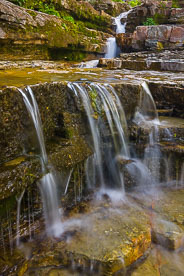 A Step at a Time - McClure Creek plunges over Eagle Cliff Falls and then over a series of rocky shelves in a narrow, rocky canyon sprinkled with autumn leaves in Havana Glen Park outside of Montour Falls, New York. 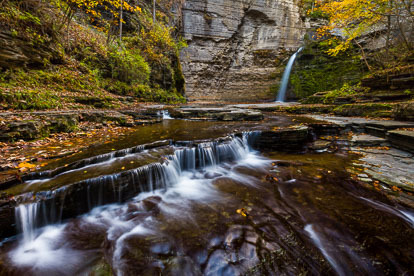 Gorge Tranquility - Glen Creek cascades down Rainbow Falls and spills into a calm pool surrounded by fallen autumn leaves in a narrow gorge in Watkins Glen State Park outside of Watkins Glen, New York. 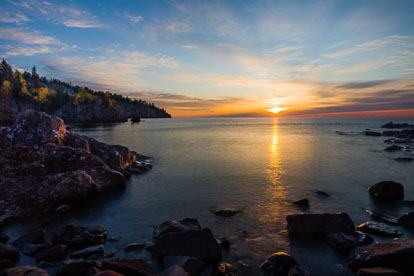 Peaceful Beginning - The sun peeks through the clouds as it rises above Lake Superior, shining light on Shovel Point and a rocky shoreline in Tettegouche State Park along the North Shore of Minnesota. 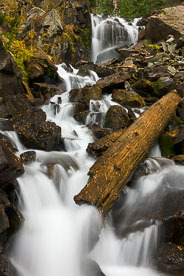 I’ll Find My Way - Lake Creek drops through a log jam and over Snyder Falls before winding through red rock walls on its way downstream in the San Isabel National Forest in Central Colorado. 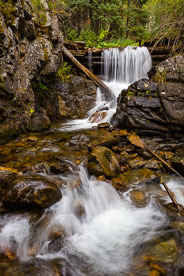 Rambling Descent - French Creek Falls spills over a log jam and winds its way through a rocky section on its race down a steep mountainside in the White River National Forest outside of Minturn, Colorado. 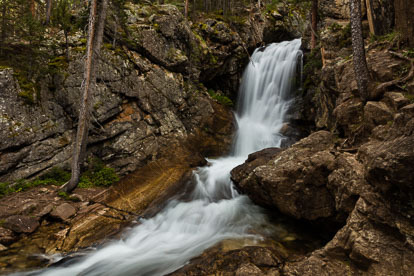 One Step at a Time - Browns Creek twists and turns down a rocky hillside after flowing over Browns Creek Falls in San Isabel National Forest outside of Nathrop, Colorado. 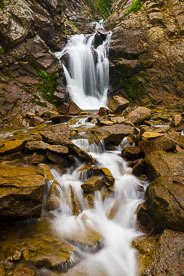 Change of Direction - The North Fork South Arkansas River tumbles down Shavano Falls and makes a sharp turn through a narrow rocky canyon in the San Isabel National Forest in southern Colorado. 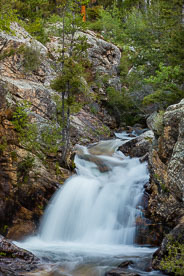 Shavano Falls-Lower Section - The North Fork South Arkansas River drops over the lower section of Shavano Falls before making a sharp turn through a narrow rocky canyon in the San Isabel National Forest in southern Colorado. 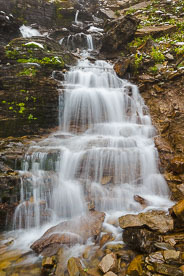 Shavano Falls-Upper Section - The North Fork South Arkansas River emerges from behind rocks and trees and cascades over the upper section of Shavano Falls in the San Isabel National Forest in southern Colorado. 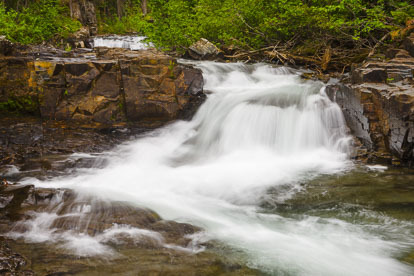 Close Quarters - The North Fork South Arkansas River makes a couple of drops down Shavano Falls in a steep rocky section of the San Isabel National Forest in southern Colorado. 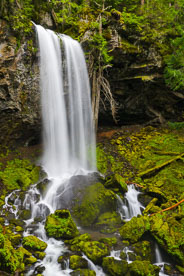 Sudden Descent - Van Trump Creek drops abruptly from the top of a massive cliff wall forming Comet Falls which plunges in a series of three steps into a lush green valley over 450 feet below in Mount Rainier National Park, Washington. 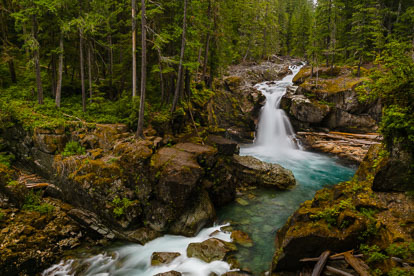 Woodlands Rambler - Van Trump Creek carves its way through the rocks and tumbles down Bloucher Falls in a lush forest in Mount Rainier National Park, Washington. 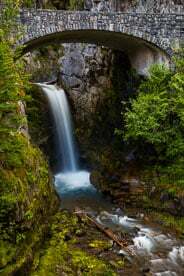 Beauty Beneath the Bridge - Van Trump Creek drops gracefully over the lower section of Christine Falls and flows underneath a rustic stone bridge in Mount Rainier National Park, Washington. 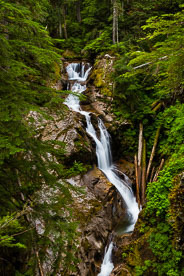 Finding My Way - Deer Creek rounds a bend in the dense forest and twists and turns its way over Deer Creek Falls as it plunges into a canyon in Mount Rainier National Park in Washington. 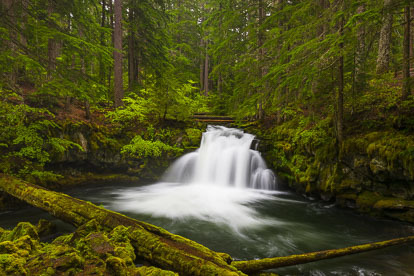 Woodland Serenity - The Ohanapecosh River winds through a dense green forest and drops over Silver Falls into an aquamarine colored pool in Mount Rainier National Park, Washington. 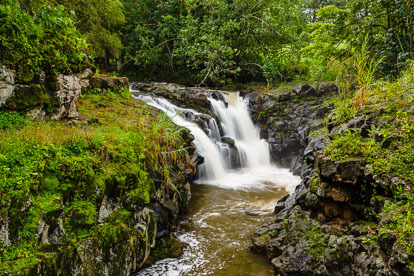 Jungle Pearl - Honolewa Stream emerges from thick vegetation and gracefully tumbles down Paihi Falls outside of Hana on the Hawaiian Island of Maui. 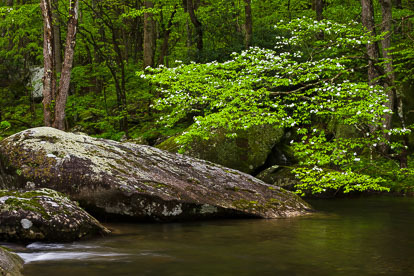 Streamside Serenity - A flowering white dogwood tree and the brilliant spring green forest reflects in the rushing water of the Middle Fork Little River in Great Smoky Mountains National Park in Tennessee. 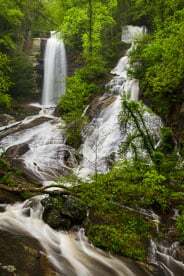 Two Become One - Reedy Cove Creek separates and takes different paths over a rocky ledge forming Reedy Cove Falls before merging downstream in the Jocassee Gorges Area in northern South Carolina. 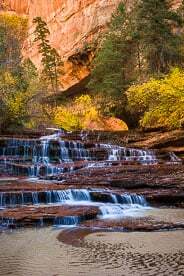 Silken Stairway - Left Fork Creek cascades down the red rock steps of Archangel Falls in a canyon punctuated by golden fall color in Zion National Park, Utah. 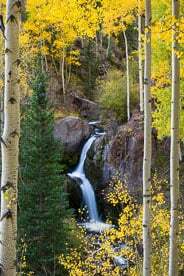 Grace amidst Gold - Graceful Nellie Creek Falls is framed by golden aspen trees in the Uncompahgre National Forest outside of Lake City in southern Colorado. 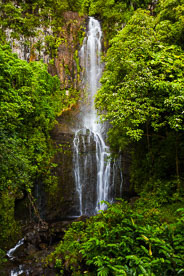 Gem in the Jungle - Kaapa Stream emerges from a dense forest canopy and gracefully flows over Upper Hoopii Falls in eastern Kauai, Hawaii. 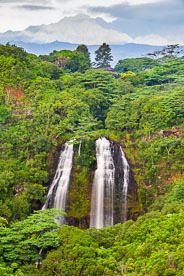 Tropical Grandeur - The Mahaleha Mountains emerge from rain clouds behind Opaekaa Falls dropping into a lush valley in Kauai, Hawaii. 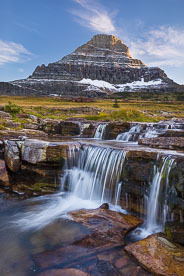 Majestic Serenity - Reynolds Creek drops over a rocky shelf in the alpine tundra below Reynolds Mountain illuminated by the fading light of dusk in Glacier National Park, Montana. 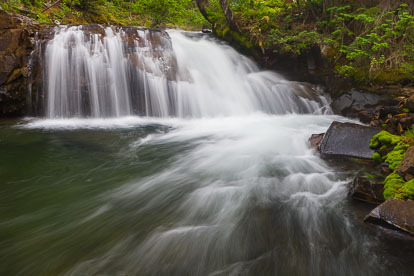 Gentle Beginning - The headwaters of Logan Creek fan out and flow over Oberlin Falls high up in the mountains of Glacier National Park. 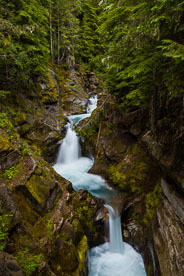 Fractured Flow - The aqua-colored water of Avalanche Creek twists its way through a red rock crevice covered in moss and ferns in Glacier National Park in Montana. 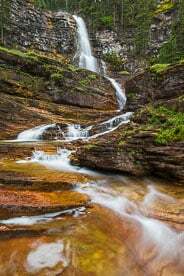 Rocky Rambling - Virginia Falls twists and turns its way down a red rock wall on its journey to meet up with the Saint Mary River in Glacier National Park, Montana. 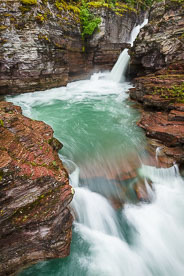 Chasm Dash - The Saint Mary River slices through a narrow rocky crevice and surges down Saint Mary Falls before taking a quick turn and rushing downstream towards Saint Mary Lake in Glacier National Park, Montana. 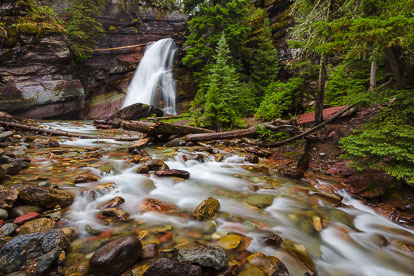 Rocky Repose - Baring Creek gently flows over Baring Falls and glides down a streambed sprinkled with red rocks on its way down to Saint Mary Lake in Glacier National Park in Montana. 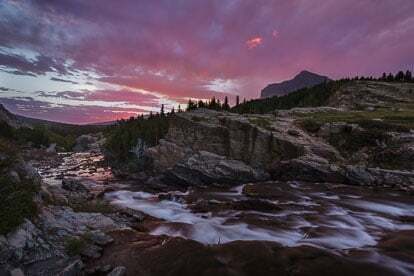 Rosy Morning Rush - Swiftcurrent Creek rushes down Swiftcurrent Falls and flows down a valley towards the rising sun and a sky full of pink clouds in Glacier National Park, Montana. 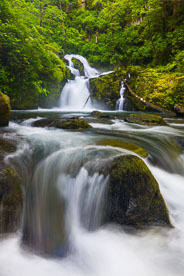 Springtime in Motion - Sweet Creek emerges from behind vibrant green foliage and flows over Sweet Creek Falls on its rocky journey downstream outside of Mapleton, Oregon. 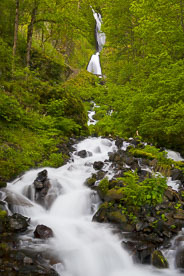 Split Personality - Grotto Falls splits in two and plunges over a deeply undercut cliff into a mossy gorge in the Umpqua National Forest in south central Oregon. 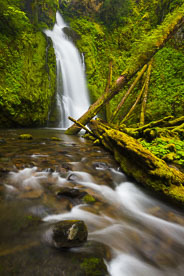 Mossy Log Diversion - Hemlock Falls twists and turns down a rugged chasm and drops into a lush green gorge littered with mossy fallen trees in the Umpqua National Forest in Oregon. 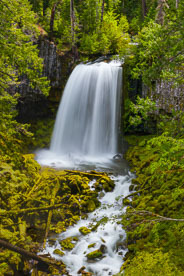 Grace in Seclusion - The Little River drops delicately over Yakso Falls into a deep pool surrounded by vibrant spring greenery in the Umpqua National Forest in Oregon. 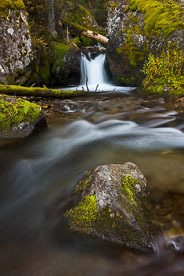 Delicate Dance - The Little River drops delicately over Yakso Falls into a deep pool surrounded by vibrant spring greenery in the Umpqua National Forest in Oregon. 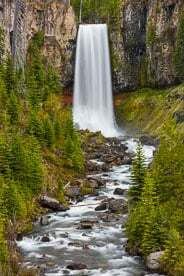 End of the Line - Toketee Falls flows through a deep gorge and drops gracefully over a wall of columnar basalt in the Umpqua National Forest in southern Oregon. 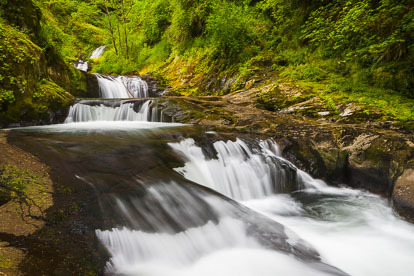 Spring Fury - Watson Falls plunges 300 feet over an amphitheater wall of basalt and crashes into a vibrant mossy talus slope in the Umpqua National Forest in Oregon. 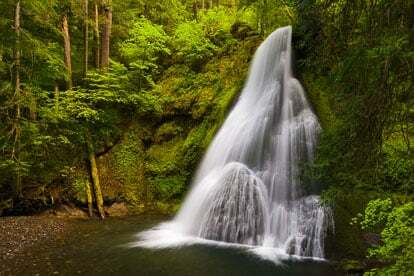 Gem in the Woods - Whitehorse Falls drops gracefully into a pool amid lush spring greenery in the Umpqua National Forest in Oregon. 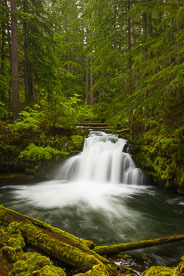 Out of the Woods - Whitehorse Falls drops gracefully into a pool amid lush spring greenery in the Umpqua National Forest in Oregon. 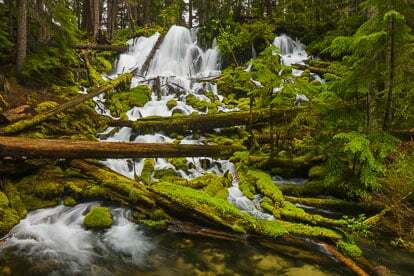 Jumbled Journey - Clearwater Falls cascades down through a jumble of moss covered rocks and fallen logs in the Umpqua National Forest in southern Oregon. 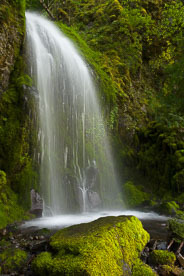 Mossy Plummet - Warm Springs Falls plummets over fifty feet into a vibrant green mossy amphitheater in the Umpqua National Forest in Oregon. 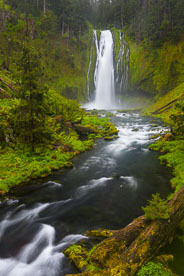 Encircled in Green - The North Umpqua River plunges more than 150 feet over beautiful Lemolo Falls before rushing downstream through a lush green valley in the Umpqua National Forest in Oregon. 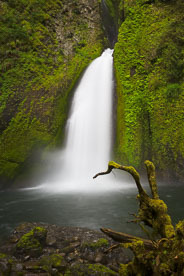 Plunge into Green - The North Umpqua River plunges more than 150 feet over beautiful Lemolo Falls before rushing downstream through a lush green valley in the Umpqua National Forest in Oregon. 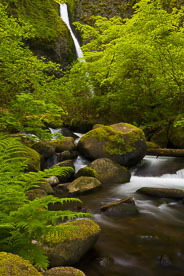 Graceful Emergence - The Rogue River emerges from dense woods and flows over Rough Rider Falls before fanning out in a mossy glen in the Rogue River National Forest in southern Oregon. 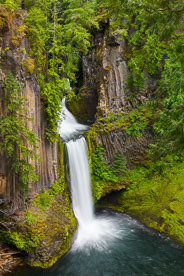 Rugged Tumble - National Creek Falls splits and tumbles down a jagged basalt wall before falling into a shallow moss filled grotto in the Rogue River National Forest in southern Oregon. 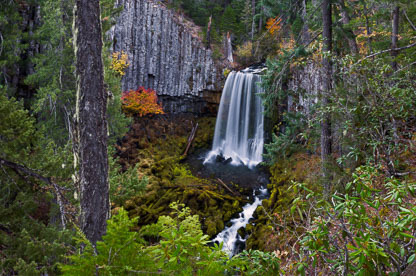 Diamond in the Rough - Diamond Creek Falls tumble over 100 feet down a broad, jagged basalt rock wall where Diamond Creek then turns sharply and continues around mossy rocks in the Willamette National Forest in central Oregon. 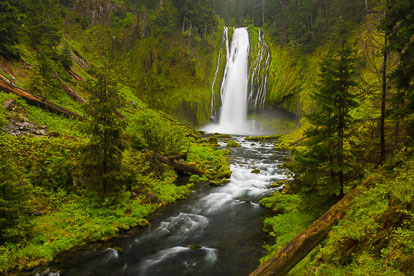 Verdant Valley Thunder - Salt Creek Falls plunges 286 feet over a massive basalt wall and into a lush valley lined with vibrant grass in the Willamette National Forest in Oregon. 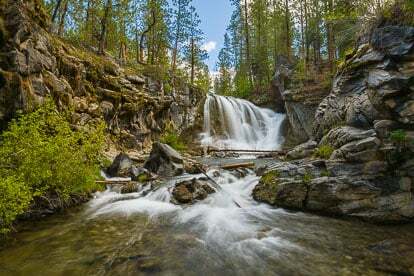 Boulder Dance - Paulina Creek gracefully flows over McKay Crossing Falls and twists and turns its way through a rocky gorge in Deschutes National Forest in central Oregon. 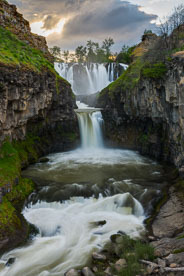 Headlong Plunge - Tumalo Falls plunges over 80 feet from the top of a sheer basalt wall and drops into a narrow gorge outside of Bend, Oregon in the Deschutes National Forest. 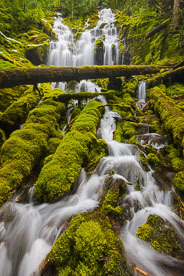 Mossy Meandering - Proxy Falls spreads out and drops in curtains over two hundred feet before tumbling through moss covered logs and rocks in the Willamette National Forest in Oregon. 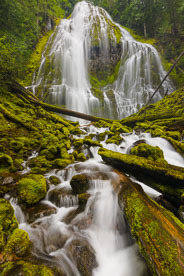 Shrouded in Green - Upper Proxy Falls cascades over a rocky ledge and twists and turns its way through a jumble of vibrant green moss-covered rocks and logs in the Willamette National Forest outside of Sisters, Oregon. 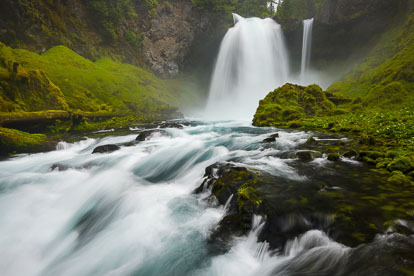 Frenzied Flow - The McKenzie River crashes over Koosah Falls, creating a cloud of mist that fills the vibrant green valley below in the Willamette National Forest in central Oregon. 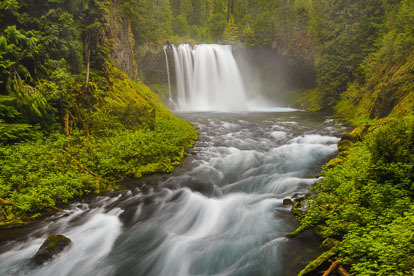 Spring Surge - The McKenzie River crashes over Sahalie Falls sending off a cloud of mist in its powerful rush downstream through a vibrant green gorge in the Willamette National Forest in Oregon. 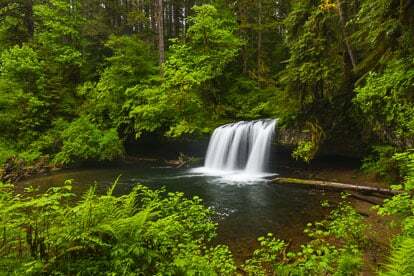 Secluded Tranquility - Upper Butte Creek Falls drops gracefully over a wide undercut ledge into a large pool surrounded with greenery in the Santiam State Forest in northwest Oregon. 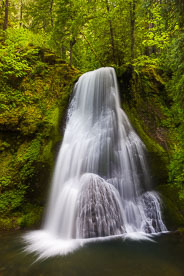 Beauty among Chaos - In a series of tumbles and turns through a vibrant green forest, Panther Creek fans out as it drops over Panther Falls outside of Carson, Washington. 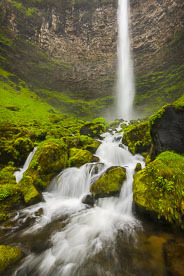 Raging Descent - The White River thunders over White River Falls into a canyon lined by basalt walls covered in vibrant green moss before dropping over the smaller Celestial Falls on its journey downstream at Falls River State Park, Oregon. 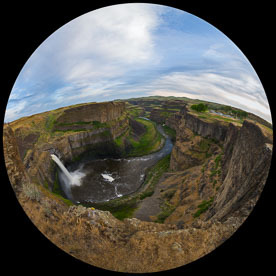 Palouse Falls in the Round - A fish-eye view of the Palouse River gushing over Palouse Falls and flowing down a lush green valley into the distance on a beautiful spring day in Palouse Falls State Park in southeastern Washington. 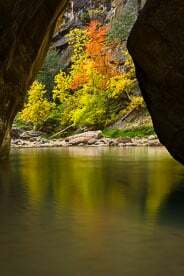 Reflected Glow - A glowing stand of multicolored trees are reflected in the smooth water of the North Fork of the Virgin River in Zion National Park, Utah. 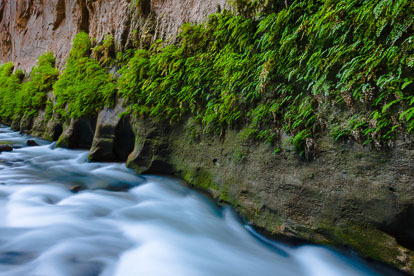 Weeping Wall of the Narrows - A small stream flows down a rock wall into the North Fork of the Virgin River in the Narrows at Zion National Park, Utah. 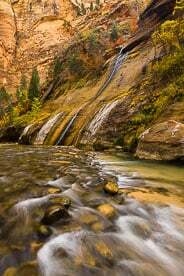 Follow the Flow - The North Fork of the Virgin River flows around a bend highlighted by golden cottonwood trees and a glowing red wall in the Narrows of Zion National Park in Utah. 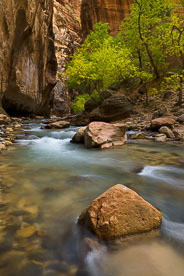 The Sprouting Wall - The North Fork of the Virgin River flows past a rock wall covered with vibrant green foliage in the Narrows in Zion National Park. 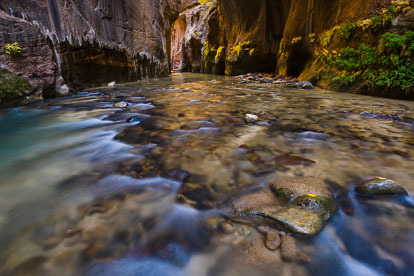 Follow the Light - Sunlight shines from around the corner and is reflected in the river in the Virgin Narrows of Zion National Park in Utah. 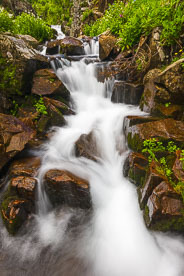 Furious Flow - Oh Be Joyful Creek flows over a waterfall on its mad dash down the mountainside to meet up with the Slate River outside Crested Butte, Colorado. 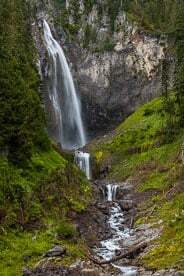 Rugged Route - Oh Be Joyful Creek winds and tumbles its way down a series of waterfalls outside of Crested Butte, Colorado. 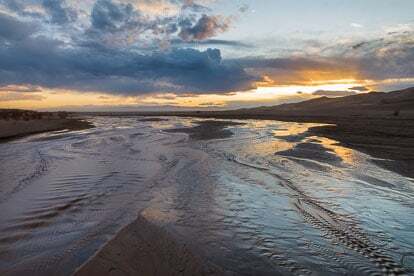 Gentle Flow - Medano Creek flows past the Great Sand Dunes towards the San Luis Valley at sunset in southern Colorado. 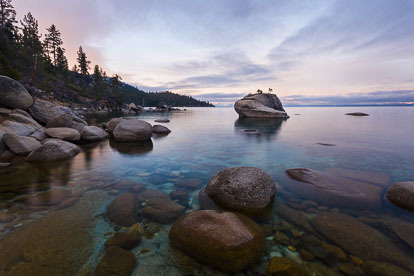 Sitting Pretty - The pink skies of dawn reflect in the calm water around Bonsai Rock at Lake Tahoe in Nevada. 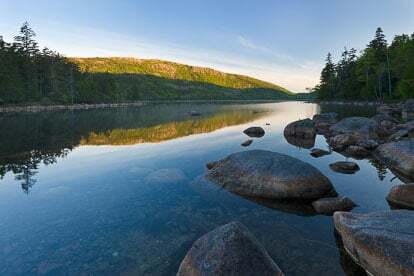 The Bubbles at Jordan Pond - The rocky shoreline of Jordan Pond directs your view to The Bubbles reflecting in the calm water at Acadia National Park in Maine. 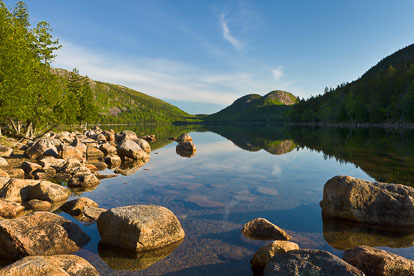 Morning Sunlight on Penobscot Mountain - The sun rises high enough in the sky to light up Penobscot Mountain and reflect in Jordan Pond at Acadia National Park in Maine. 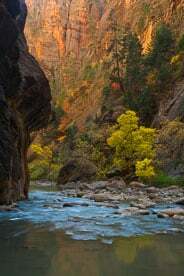 Color in the Canyon - The trees begin to turn gold in the Narrows of the North Fork of the Virgin River in Zion National Park, Utah. 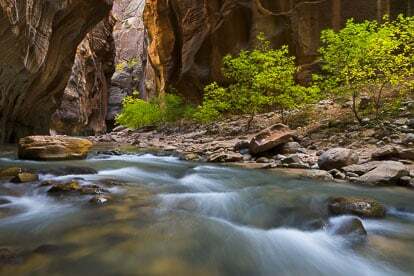 Winding through the Narrows - The North Fork of the Virgin River winds through the canyon walls of the Narrows in Zion National Park, Utah. 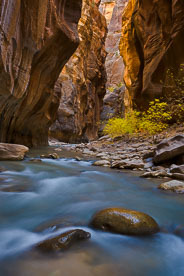 Through the Rocks - The North Fork of the Virgin River winds through the canyon walls of the Narrows in Zion National Park, Utah. 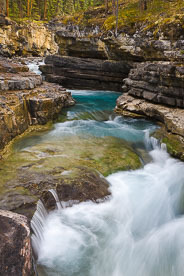 Around the Bend - Kanarra Creek flows over a waterfall and into a rock canyon outside of Kanarraville, Utah. 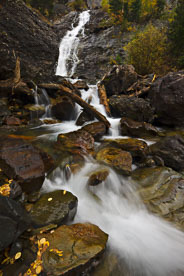 Over the Rock - Fall foliage stands above a waterfall on Kanarra Creek outside of Kanarraville, Utah. 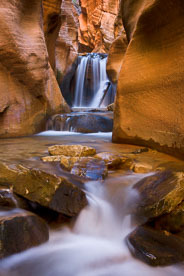 Red Rock Waterfall - A waterfall on Kanarra Creek in a narrow red rock canyon outside of Kanarraville, Utah. 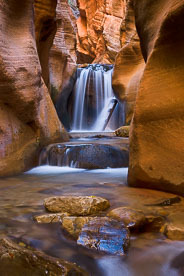 Through Narrow Walls - Kanarra Creek flows over a waterfall in a red rock canyon outside of Kanarraville, Utah. 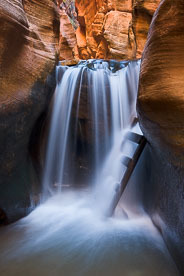 Through the Falls and into the Canyon - A ladder stands in a waterfall on Kanarra Creek outside of Kanarraville, Utah. 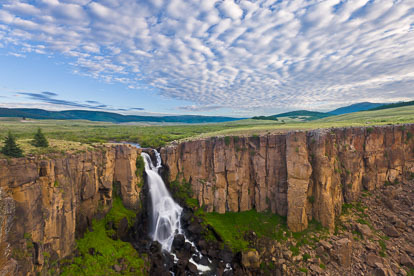 Daybreak at North Clear Creek Falls - The morning clouds start to break over North Clear Creek Falls outside of Lake City, Colorado. Cluttered Creek - Columbus Creek scrambles over logs and rocks on it's way down the mountainside to the La Plata River outside of Durango, Colorado. 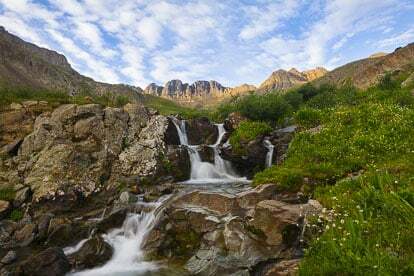 American Basin Sunrise - First light shines on the San Juan Mountains above a small waterfall in American Basin in southwestern Colorado. 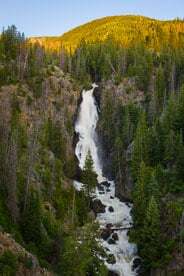 Fury of Fish Creek Falls - Early summer runoff plunges over Fish Creek Falls in Steamboat Springs, Colorado. 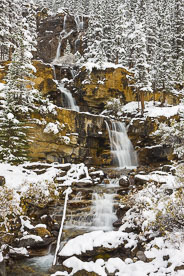 Fresh Snow on Tangle Falls - Tangle Falls flows through snow covered scenery along the Icefields Parkway in Alberta. 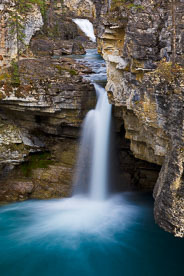 Limestone Falls - The rushing Beauty Creek drops over one of the many waterfalls on it's drop through a limestone walled canyon in Jasper National Park in Alberta, Canada. 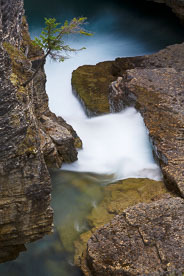 Through Limestone Walls - Beauty Creek carves its way through the limestone walls of Stanley Falls Canyon in Alberta, Canada. 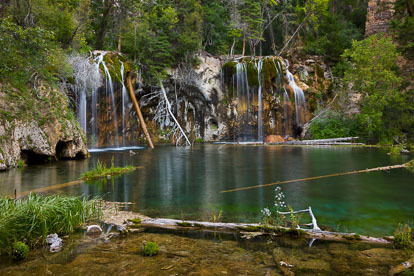 Hanging Lake - The calm waters of Hanging Lake below Bridal Veil Falls outside of Glenwood Springs, Colorado. 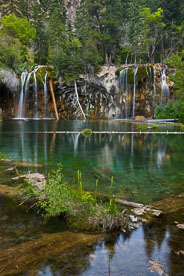 Hanging Lake Panorama - Panoramic image of the travertine water of Hanging Lake outside of Glenwood Springs, Colorado. 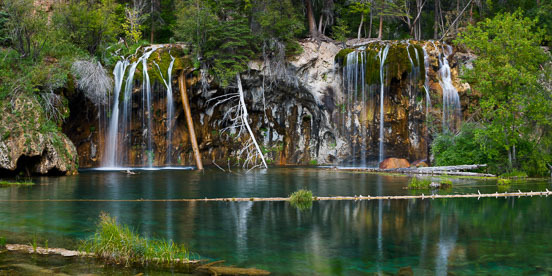 Travertine Beauty - Bridal Veil Falls flows into the travertine water of Hanging Lake outside of Glenwood Springs, Colorado. 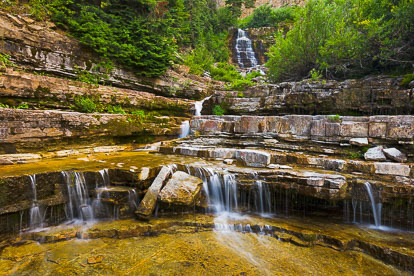 White Owl Creek Falls - White Owl Creek drops over a series of rock ledges on its way down to meet up with Deep Creek near Glenwood Springs, Colorado. 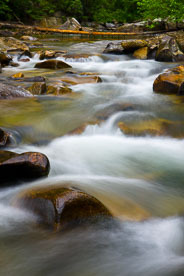 Rocky Flow - White Owl Creek flows over a rock ledge in the Flat Tops area of western Colorado. 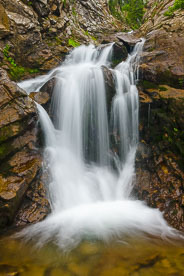 Graceful Flow - Middle Creek tumbles gracefully over Middle Creek Falls late in the summer outside of Crested Butte, Colorado. 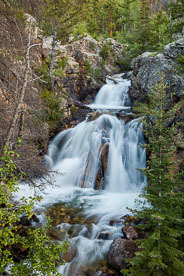 Middle Creek Falls - Middle Creek Falls flows at full force with water from melting snow pack outside of Crested Butte, Colorado. 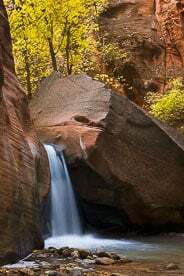 Tumbling Sweet Creek - Sweet Creek tumbles down a series of cascades known as Punchbowl Canyon Falls outside of Mapleton, Oregon. 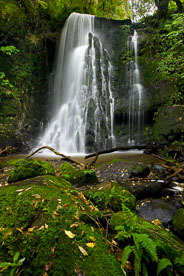 Waiau Falls - Waiau Falls plunges into a deep pool in a forest on the North Island of New Zealand. 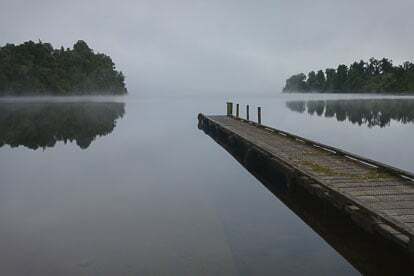 Silence in the Fog - Early morning fog lifts off of Lake Mapourika on the South Island of New Zealand. 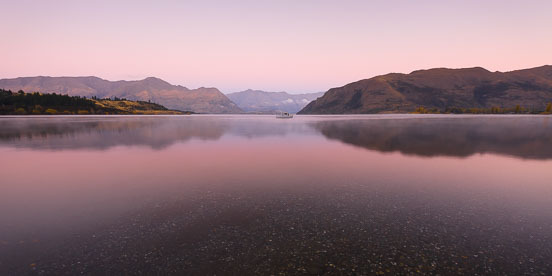 Serenity at Lake Wanaka - Predawn light bathes Lake Wanaka with soft pink light outside of Wanaka in New Zealand. 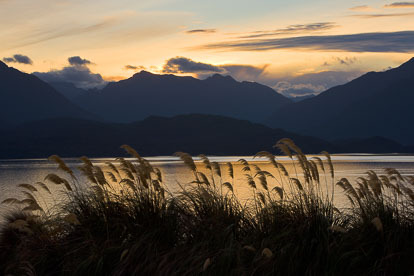 Lake Te Anua Sunset - A golden sunset reflects in Lake Tahoe behind a stand of native toetoe grasses outside of Ta Anua in New Zealand. 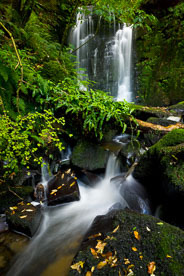 Forest Waterfall - Horseshoe Falls flows through lush greenery on the South Island of New Zealand. 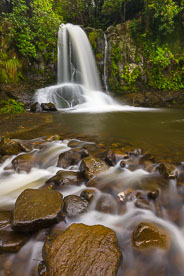 Graceful Falls - Graceful Matai Falls surrounded by lush greenery on the South Island of New Zealand. 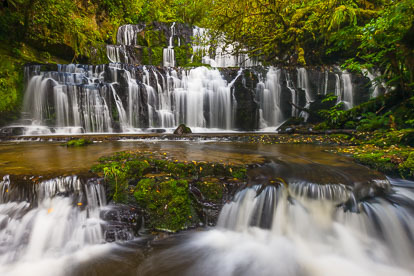 Purakaunui Falls - Multi-leveled Purakaunui Falls in the rainforests of South Island in New Zealand. 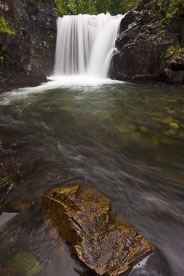 Alpine Falls - Falls on the East Fork of Dallas Creek high in mountains outside of Ridgway, Colorado. East Fork Dallas Creek Falls - Lush fall greenery surrounds East Fork Dallas Creek Falls outside of Ridgway, Colorado. 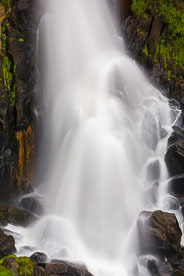 Umcompaghre Falls - A fall rain shower adds to the flow of water down Umcompaghre Falls outside of Ouray, Colorado. 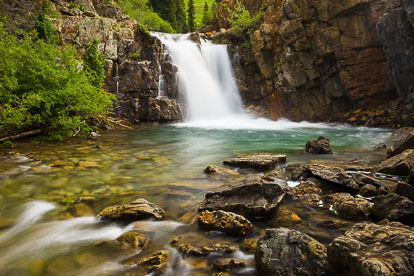 Upper Crystal River Falls - The Upper Crystal River flows over a waterfall high in the mountains outside of Carbondale, Colorado. 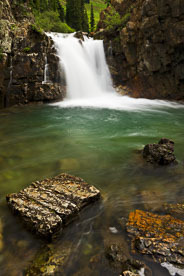 Upper Crystal River Waterfall - Vertical - The Upper Crystal River flows over a waterfall high in the mountains outside of Carbondale, Colorado. 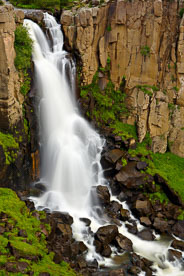 Oh Be Joyful Creek Waterfall - One of the many waterfalls along Oh Be Joyful Creek outside of Crested Butte, Colorado. 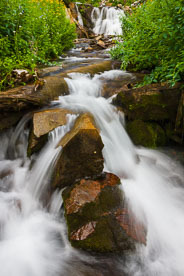 Peaceful Stream - Lincoln Creek winds it's way through the rocks outside of Aspen, Colorado. 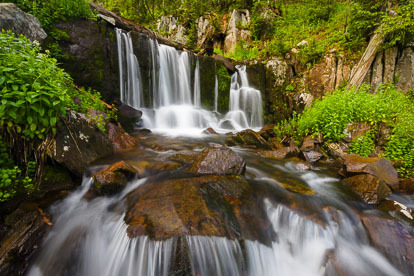 Summer Stream - Columbus Creek tumbles through a canyon filled with wildflowers in La Plata River Canyon in southwestern Colorado. 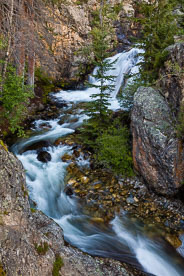 Columbus Creek - Columbus Creek tumbles down the mountainside in the La Plata River Canyon in southwestern Colorado. 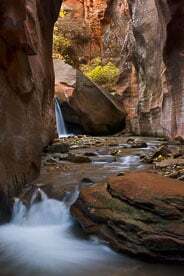 Blazing Brush - Light making its way into the canyon light up the wall and the autumn brush along the river in the Narrows at Zion National Park in Utah. 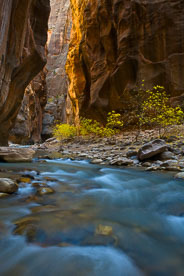 River Through Red - The North Fork of the Virgin River flows through the red canyon walls of the Narrows at Zion National Park in Utah. 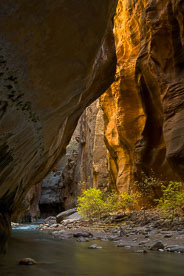 Glowing Canyon - Light reflects of the walls of the canyon and accentuates the colors of the river and the fall foliage in the Narrows at Zion National Park in Utah. 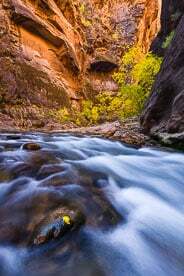 Fall Color in the Narrows - Fall colors compliment the red rock and reflect in the water of the North Fork of the Virgin River as it flows through the Narrows at Zion National Park in Utah. 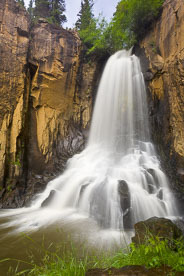 South Clear Creek Falls - South Clear Creek flows off a cliff outside of Lake City, Colorado. 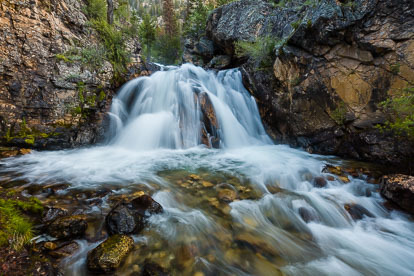 Crashing Water - A small stream crashes on the rocks in this detail shot of the base of North Clear Creek Falls outside of Lake City, Colorado. 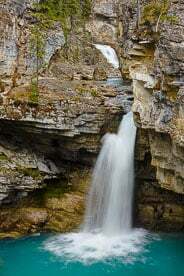 North Clear Creek Falls - North Clear Creek plunges over a sheer rock cliff after meandering through North Clear Creek Park outside of Lake City, Colorado. 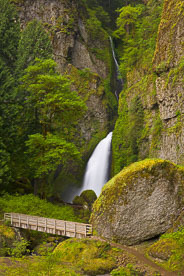 Over the Bridge - A foot bridge crosses in front of Wahclella Falls in the Columbia Gorge, outside of Portland, Oregon. 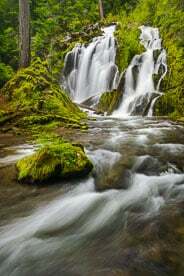 Around the Bend - Wahclella Falls makes a couple of drops and then flows around a bend in the Columbia Gorge, outside of Portland, Oregon. Alien Stump - A moss covered stump lies at the base of Wahclella Falls in the Columbia Gorge, outside of Portland, Oregon. 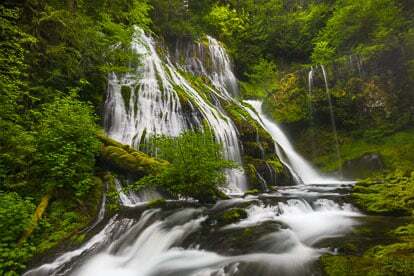 Split in Two - Gorton Creek Falls splits into two smaller falls in the Columbia Gorge, outside of Portland, Oregon. 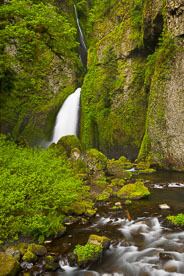 In the Green - Ponytail Falls behind lush green foliage in the Columbia Gorge, outside of Portland, Oregon. 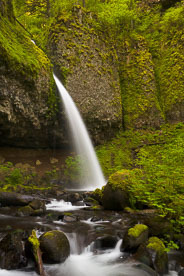 Out of the Rock - Ponytail Falls spouts out of a rock in the Columbia Gorge, outside of Portland, Oregon. 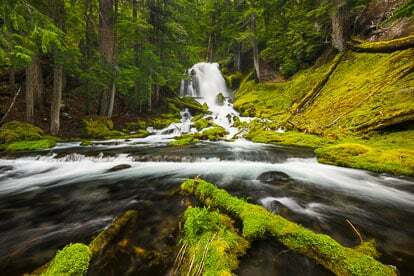 Falls in the Moss - Moss covered rocks surround Lancaster Falls in the Columbia Gorge, outside of Portland, Oregon. 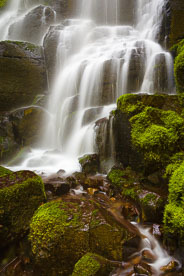 Water and Moss - A section of Fairy Falls in the Columbia Gorge, outside of Portland, Oregon. 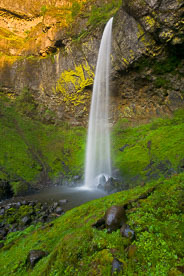 Fan-Tail Falls - Wahkeena Falls fan-tails into a pool in the Columbia Gorge, outside of Portland, Oregon. 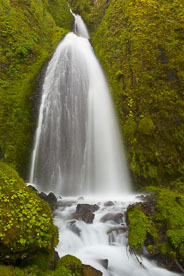 Down the Hill - Wahkeena Falls drops down the hillside in the Columbia Gorge, outside of Portland, Oregon. 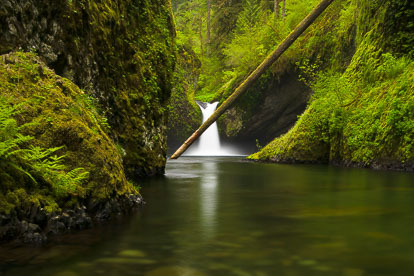 Behind the Log - Punchbowl Falls drops in to a pool behind a fallen tree in the Columbia Gorge, outside of Portland, Oregon. 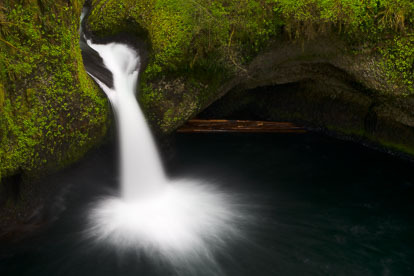 Into the Bowl - Looking down on Punchbowl Falls as it plunges in to a pool in the Columbia Gorge, outside of Portland, Oregon. 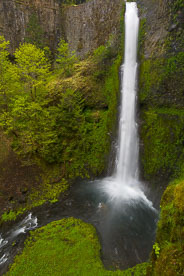 Big Drop - Tunnel Falls drops 100 feet in front of the trail that passes through a tunnel behind it at the Columbia Gorge, outside of Portland, Oregon. 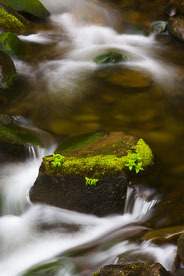 Mossy Rock - A moss covered rock sits in the stream below Elowah Falls in the Columbia Gorge, outside of Portland, Oregon. 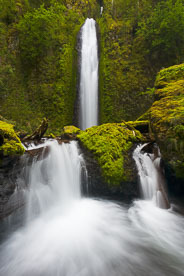 Over the Wall - Elowah Falls flows over a wall into a moss surrounded pool in the Columbia Gorge, outside of Portland, Oregon. 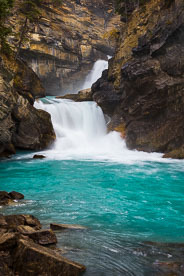 Graceful Falls - The turquoise waters of Beauty Creek flow gracefully over a cliff in Jasper National Park, Alberta, Canada. 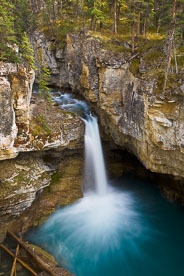 Pleasing Pool - A waterfall on Beauty Creek drops into a turquoise pool in Jasper National Park, Alberta, Canada. 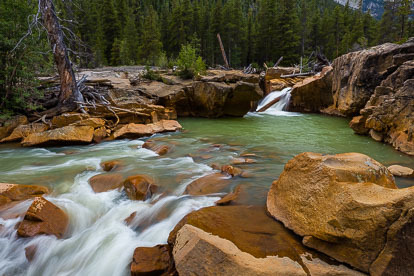 Lone Tree - A small tree hangs over Beauty Creek in Jasper National Park, Alberta, Canada. 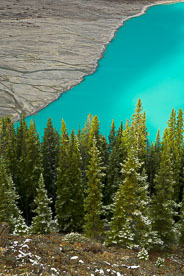 Shoreline Contrast - A grey shoreline contrasts the turquoise glacial waters of Peyto Lake in Banff National Park, Alberta, Canada.